The questions sometimes leads us to the possibility that God may exist, but is not knowable on any provable, earthly level. 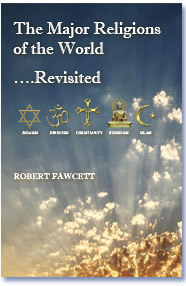 Most religions suggest we must have faith that God exists, and that he will be revealed at some later date. In the meantime, follow your religion's tenets, live a good life and "keep the faith," and you may get to see God in heaven. For some of us our faith works quite well. It takes the pressure off and lets us avoid a confrontation with science and does give us peace in our lives. Our chosen faith sustains us and following a religious life lets us feel part of something larger than us‚ and also lets us be an acceptable part of the community. Our parents, family, and friends may have helped point us in this direction either directly or indirectly. Our religion may be a big part of our family life and lifestyle. But sometimes we reach a point where that is not enough. We feel hypocritical, and a gnawing doubt that won't let us have the peace and tranquility that we seek. Perhaps a life event like either a death or world tragedy makes us question our faith, and wonder just what kind of God we have chosen. Or even if there is a God. After all, would a loving God allow the world to be as it is with wars, famine, and strife? This is the crucial moment. Do we rejoin the search for God, or perhaps abandon God altogether? If we choose to become either an atheist or an agnostic are we only avoiding the question? Sometimes "God's Gravity" takes hold, and we feel compelled to renew our search for answers. That's when we might decide to explore other religions and other views of God. There are certainly many to choose from. If you are on the path we understand. The search for meaning in our lives is not easy, and if we are experiencing depression, it can be painful. 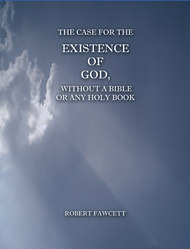 We hope you can find some answers and solace in the SPECIAL REPORT, The Case For The Existence Of God, Without A Bible or Any Holy Book. We are all on this quest together, and we wish you peace on your journey.